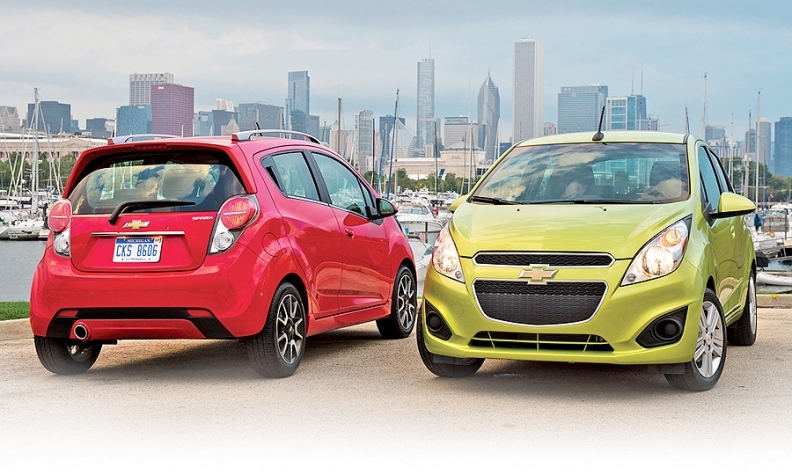 GM sold 34,130 Chevy Sparks in the United States in 2013. General Motors is recalling nearly 51,000 Spark and Sonic subcompact cars in the U.S. and Canada for a software issue that can turn off warning chimes or in some cases drain the battery. The recall covers Sparks and Sonics from the 2014-15 model years, including 45,785 vehicles in the U.S. and 4,568 in Canada. Affected vehicles are equipped with software that can cause the radio to lock up and lose display and audio functions, including chimes that warn the driver of keys left in the ignition or a seat belt that is not in use. Without warning chimes, the vehicles are not in compliance with U.S. federal regulators’ vehicle safety standards for theft and occupant crash protection. In other cases, the radio may not turn off, draining the battery and preventing the vehicle from starting. The radio lock up can happen while the driver has the OnStar turn-by-turn directions in use, GM said in a statement. A GM employee opened a “Speak Up for Safety” case related to the issue in April, and the company opened a formal investigation early last month. GM decided to conduct the non-compliance recall on June 17. A stop-sale order had been issued on 13,605 of the vehicles, but it was lifted on June 24 when the repair procedure was released to dealers. GM CEO Mary Barra announced the Speak Up for Safety program last year after a defective ignition switch linked to more than 120 deaths and 260 injuries prompted a recall of 2.6 million small cars. Affected owners will be notified by mail and can have repairs made for free at any Chevrolet dealership.